For the past four weeks I was part of WordPress.com’s Blogging University: Blogging 101 program, a neat little class on learning some basics about blogging along with some prompts/assignments for getting started on blogging. Though I have actually been blogging causally for a few years now, I wanted to take this course for a way to get me more serious about my blog. The assignments aren’t required, but it’s fun to try them out, especially when they’re something you haven’t tried before or out of the comfort zone. They’re also not always a posting assignment; sometimes it will be to try out a different theme or add some widgets. It took me a week to really get involved, but I’ve learned a bit and I’ve met some cool cats in Blogging 101. I feel that the social interaction of Blogging 101 was the best part of the course. I was able to connect with a lot of other bloggers and found some amazing new blogs to follow. I am hoping to keep up with these wonderful people and develop some friendships with them (it wouldn’t be my first time making close friends online). Worrying About Worry, It’s Not Just Me! Those were a few of the assignments I really enjoyed writing and were inspiring to me. Take the last one for example, the assignment was to do a prompt off of The Daily Post and it was refreshing to see what I would take from the prompt. Just as well, the ‘Worrying’ post I enjoyed writing because it was taking someone else’s post and expanding off of it with my own twist. That was a fun challenge and will be a tactic I use for future blog posts, especially knowing that everyone has their own viewpoint on the same topics. So overall, Blogging 101 was a great experience and I am looking forward to participating in Blogging 201 this month! I hope to see familiar usernames in The Commons and continue to grow as a blogger alongside my comrades. 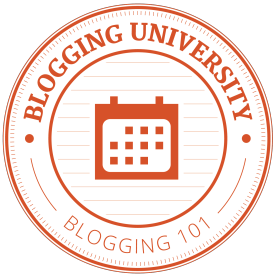 And if you are looking for a way to start a blog or expand yours, I suggest you sign up for a Blogging University course! Hey there! Discovered your blog after you followed mine and decided to check it out. Besides the fact that you have the COOLEST name in the world ;), I enjoy your blog so far, and look forward to reading more. I had actually thought about checking out the Blogging 101 course. I’ve been blogging now for almost 15 years, but I believe it’s always a good thing to check out what the new ‘basics’ are, and keep educating yourself. After all, the world of blogging has changed drastically from when I started way back then. Glad you found the course pretty good. I’m thinking I’ll participate in the next one when it comes up. Well, there’s no doubt that you have the COOLEST name in the world as well ;D And thank you! I agree, it’s never a bad idea to keep up on the changes that come with blogging. I definitely had to go back to the basics since I took a while off from blogging regularly. Even though I’ve done 101, I’m thinking I’ll do it again when it comes up even if it’s just to meet other bloggers. It’d be great to see you in the course as well!